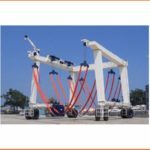 China Travel Lift Crane Has Large Loading Capacity Simple System Affordable Price Great Choice For Vessel Lifting! China travel lift crane has wide application all over the world. Many customers purchase travel lifts from China, products made in China have advantages as top quality and factory price. 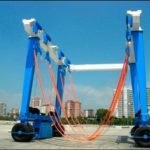 China travel lift crane is amphibious, it can be used for putting boat in water and transporting or maintaining boat on the land. 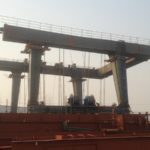 This kind of gantry crane has strong loading capacity, customers can choose suitable tons according to practical needs, such as 10 ton boat hoist, 25 ton marine travel lift for sale, 100 ton marine travel lift for sale, 500 ton mobile boat lift gantry crane, 1000 ton marine travel lift. 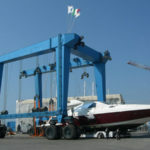 Ellsen Group, a professional travel lift crane manufacturer in China, provides cost-effective marine boat hoists gantry cranes for sale, such as port used small travel lift boat crane, shipyard travel lift, construction travel lift, travel lift for aquatic clubs, ISO approval marine travel lift, safe driving steady travel lift, remote control boat hoist, cabin control travel hoist, all-wheel steering travel lift. China supplier travel lift for sale is a great choice! Reliable performance, high quality and low price! 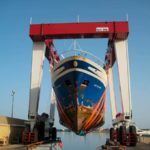 According to practical conditions and requirements, customers can choose suitable marine boat hoists from Ellsen! Purchase China manufacturer travel lift for sale! 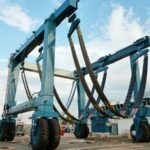 How to choose a nice China travel lift manufacturer? Travel lift manufacturer must be professional, this means the supplier has its own technical team, strict producing standards, careful package and great after-sale service. Its products have steady performance, great quality, factory price, high safety and long service life. For travel lift package, electric parts are packed by high quality plywood crate to reduce distortion in conveying. Main beams, end beams and trolley are packed by plastic woven cloth. 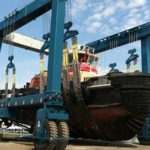 It can reduce abrasion when transport. If the size is suitable for container ship, the parts are packed by container. 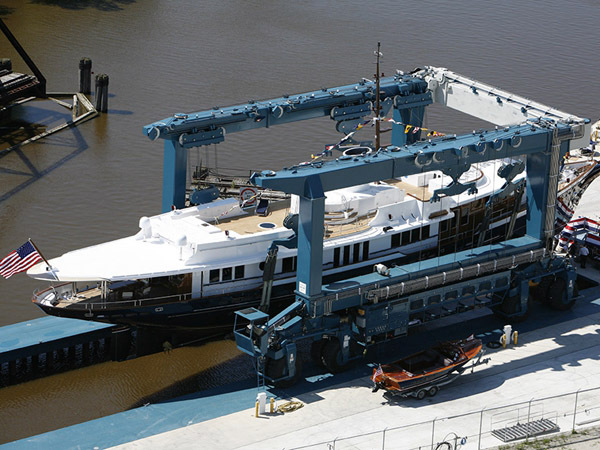 For big size, travel lift can be packed by bulk ship or by container after truncation.